Connecticut Light & Power No. 2 is unique in our museum collection of locomotives. Constructed in 1941 by Heisler in Erie, Pa., this steam locomotive is called a “fireless” because it has no boiler of its own. Instead, a stationary boiler charges the pressure vessel tank. Since locomotives like these were designed to work in industrial applications, they were never far from the charging supply. The advantage to “fireless” locomotives was there was less chance of accidental combustion from a sparks, such as those emitted by a traditional steam locomotive. This locomotive worked for Connecticut Light & Power at their Devon electric generating station in Milford, Conn., to move coal cars around the facility. According the November 1979 edition of company newsletter “Northeast Utilities Scope,” a non-profit group called Steam Associates acquired CL&P 37 from the Devon plant during the summer of 1978. It was moved to the Seaview Railroad in Davisville, Rhode Island, where it was charged up and put through a few test runs. This was the first time the engine had been run in more than 20 years. The locomotive was later moved to Wayland, N.Y., where it was stored at the Gunlocke Corp. and operated on a small section of track by the owner. It was later offered to our museum. The locomotive was acquired by the Rochester & Genesee Valley Railroad Museum in 1998, and arrived at our museum in June 1999. 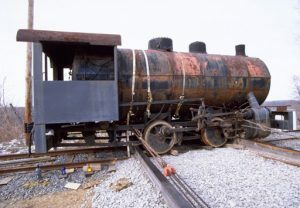 While some preliminary clean-up work has taken place, there are no immediate plans to restore or operate this locomotive. It remains in storage, and is not on public display.